The Honors Symposium showcases academic research and creative scholarship by JMU Honors students. Seniors give poster presentations about their Honors Capstone Projects, answer questions, and discuss their work with the public. Students in select Honors courses present their unique, interdisciplinary work. 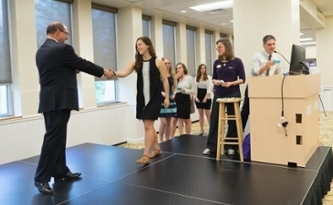 Overall, the symposium is a signature feature of the JMU Honors College experience. All students, faculty, alumni, family, and friends are welcome to attend. List of Presenters will be updated in late November. Questions about the symposium? Contact Jared Diener, Academic Advisor.